Where does your heart live? That's what these verses are all about. It's about where we spend the most time with our hearts. Is there a constant awareness in your life that God is present? Is he the unseen but always present companion in all your ups and downs? Or is God here when it is convenient and gone when things are busy or we feel that everything is going okay? Joy comes from knowing we are never alone. Prayer is the ongoing conversation we have, Spirit to Spirit, child to Abba, human with God. 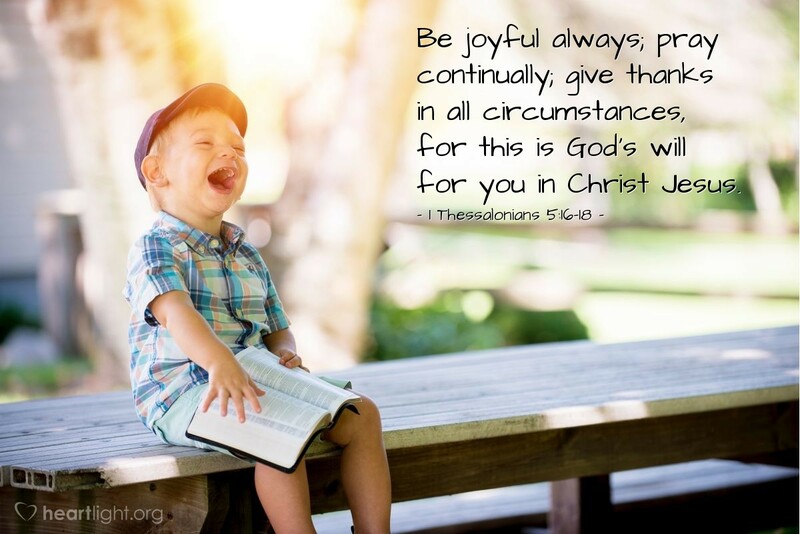 Thanksgiving and joy are the great reminders that we have been blessed no matter what the outward circumstances imply. Precious and Righteous Father, thank you for being there, always. Give me a deeper appreciation and a more profound awareness of your presence today. May my life reflect the joy you have given me by saving me by grace. And may my heart always find its home in you. Through the name of Jesus my Savior and friend I pray. Amen.